Enrichment has numerous benefits for small pets including better health, decreased boredom, and increased activity throughout the day. One way to enrich the lives of the small animals we live with is to provide food puzzles. This particular puzzle is great for providing both mental and physical activity, while making meal time FUN! All you need to get started is a wiffle ball (found in the sports section of most stores), and some appropriate treats for your pet. In the beginning start with small pieces of treats that easily fall from the ball, to ensure that your pet is successful. Pieces that stick out and can be easily pulled from the puzzle are another great way to encourage simple interactions with the toy in the beginning. Starting with too difficult a puzzle can cause your pet to lose interest and give up. 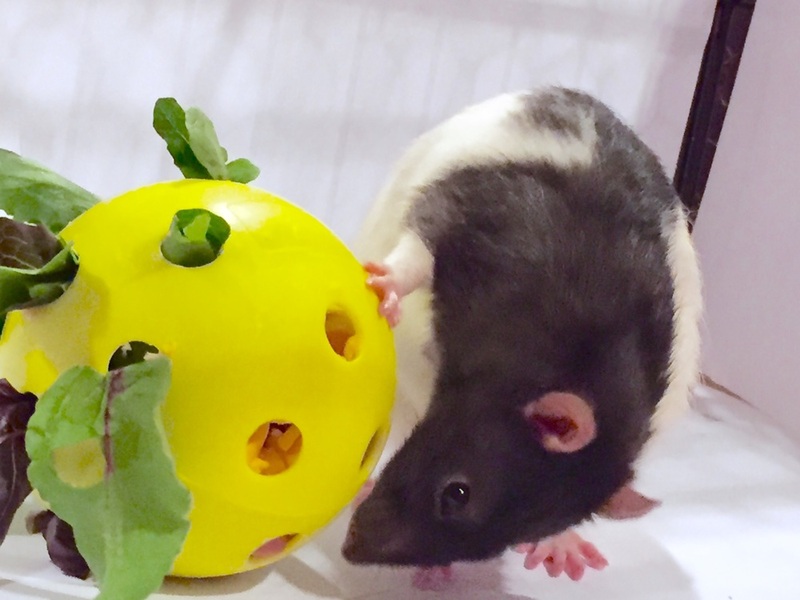 The goal is to foster a love of the challenge, so that your pet can find enjoyment in foraging for some treats and actively chasing the ball around their enclosure. Raise the difficulty over time by stuffing it with larger treats, or pieces that take more effort to pull through the holes. Most importantly, have fun! !